When visiting a new place, travel guides are always trumped by insider knowledge, although you do have to get your buddy's ESPN password to access it. It’s "chrisbermanpainpills69", but don't worry about that any more, 'cause you're getting your travel tips from Ajungo. 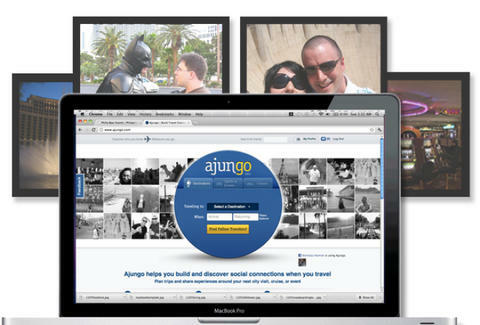 When a lack of proper travel info led to the Philly founders' post-sunset mugging in Rio and a missed opportunity to hang out with a presumably non-mugger friend in Uganda, they up and created Ajungo, which lets you easily find out where people you’re connected with live or have visited, so you can beg them for precious information. Once signed up, it'll pull all your contacts in, showing you who’s already using the site and allowing you to add friends and other users into your "travel circle"; you'll then get access to their past "trip diaries" full of geo-tagged Flickr and Facebook photos, because nothing's more helpful when visiting strange lands than seeing how satisfyingly fat your ex-girlfriend's gotten. Profile created, you can post a trip with destination info and travel dates, which'll pull up a color-coded map plotting out who in your circle's been there, who's doing trips there in the immediate future (so you hook up with them...maybe even sexually! ), and who calls it their hometown, allowing locals to act as liaisons and offer advice on their city (a la "Don't walk anywhere in Rio after sundown") and its hot spots, or volunteer as a driver or translator, a movie role for which Ryan Gosling has a memorable book jacket. Ajungo's got robust privacy, so you can keep your house from getting broken into by choosing to only share info with those in your circle, and they're also building out a local Philly events section to help find a spot to do things like tailgate, which's what Chris Berman will flagrantly do to you when he’s charging up to Canada in need of his deux-deux-deuxes.